Three years ago, I was glued to the TV, night before an exam, watching the end of one Prime Ministership and the beginning of another. The uneasiness in my stomach turned into a sinkhole as I watched Rudd’s tearjerker farewell speech the next morning. I did not, and still do not, believe Gillard was part of Rudd’s ousting until he implicitly questioned her loyalty on the day of the challenge. I nonetheless felt a wariness towards the new PM for her violation of principle. I came to see Gillard as an amazing leader. I regard the events of Wednesday night as a mistake. She was many things – an intelligent, consultative, down to earth leader with an exacting policy knowledge. But the word that yells loudest in association to Gillard is “tough”. The PM was tough as nails, as tough as any politician in living memory. And bloody hell was it tested during her Prime Ministership. Gillard’s 2010 election campaign looked to be a success – she consistently outpolled Abbott until the derailing cabinet leaks. In the face of these, she kept on going, clawing back votes from the Coalition even as party disloyalty divided national attention. Gillard forged the minority government, an arcane art not practised since WWII. These challenges seem small in retrospect. The hung parliament delivered farsighted agenda items – putting dollars behind education reform and hospitals, the carbon tax, proper and smart care for people with a disability and savings measures which in a less political environment would be described as common sense. All smart, long-lasting, hard to negotiate reforms avoided by previous governments. There’s more of that, and of course there were failures. But to look at what she was up against and declare her achievements insignificant is dead wrong. Abbott has been an extremely combative, disciplined and opportunistic opponent. And Labor’s internal problems have dogged Gillard every step of the way. These were both amplified by the media environment. While I don’t believe “the media” actively sought her downfall (Alan Jones et al. notwithstanding), the “he says, she says, poll says” reporting that has been excused for journalism in recent times suited both campaigns against her. Little substance was demanded of Abbott’s fact-free rhetorical campaigning, and dissidents in her own party found their whispering campaign quickly reached megaphone volume, no matter the reality or their credibility. I can only respect the PM who braced against ill winds and got on with the job, governing for Australia when politics turned personal. Before the ballot, Gillard made an important commitment: she would leave parliament if she lost, forever ending the Gillard/Rudd saga. She didn’t have to. When Rudd got significantly less support in 2012 than Gillard did on Wednesday, he remained to challenge again. That Gillard is the one to rise above this – even in defeat – speaks volumes about her dedication to her country and cause. This is ultimately why I believe on Wednesday night, we finished the chapter of a Labor hero’s leadership. Julia Gillard fought genuinely with every fibre of her being for her vision of Australia. An intelligent, compassionate Australia. People will quibble about “the gender issue”. Fact is, Gillard did have it tougher than men. But we don’t need to point to her gender to assess her success – her achievements, in all the areas that matter, are worth praise in their own right. The future is Rudd’s, for a while. Good luck to him going forward – we need genuine political contest in this country. But he, and the rest of us, would do well to remember that Gillard was so much more than a seat warmer during the break. The now-former Prime Minister deserves so much more admiration than she was given during her term. But I feel like she wouldn’t have been stung that much. She’s too damn tough. 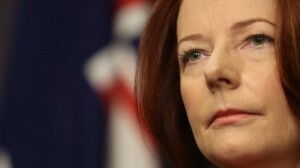 This entry was posted in Opinion, Politics and tagged julia gillard, labor, Opinion, politics. Bookmark the permalink.